I'm always looking for new ground beef recipes. We can only eat so many tacos, burritos, burgers and casseroles. I found this super yummy recipe for cheeseburger flatbread melts on kevin & amanda and was immediately interested. Brown the ground beef. Add water, ketchup, onion soup mix, garlic powder, and mustard. Stir to combine and simmer over low heat. Heat 2 tbsp of vegetable oil over medium heat in a large, heavy bottomed skillet. Divide the pizza dough into six equal portions and roll to flatten. Try to get it as round as you can. Pan fry the dough for one minute on each side or until golden brown and bubbly. 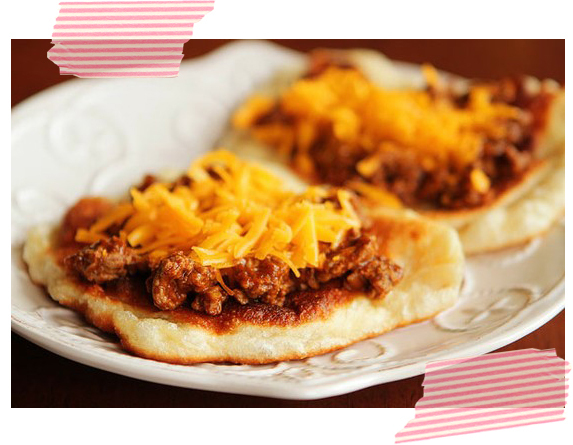 Top the flatbreads with the beef and top with grated cheddar cheese. I also like to make "cheeseburger pockets" by stuffing canned crescent dough with the ground beef and cheese and then I bake them for about 10 minutes. Do you have any other ground beef recipes for me? We're always looks for new things to try out! These look so good! I'm adding this to my to-make list, right now!